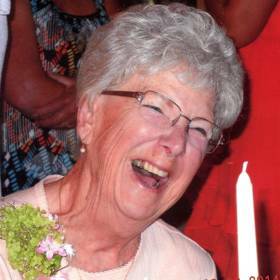 Nancy Joan Marek, 82 of Traverse City, died Wednesday, October 19, 2016. She was born on September 18, 1934 in Detroit the daughter of Joseph Leo and Stella Mary (Chincinski) McKlin. Nancy and her husband owned the Brookside Resort. She was a member of the Interlochen Senior Center and the St. Mary's Hannah women's club and the choir. Nancy loved gardening and all kinds of crafts. Nancy is survived by her husband, Joseph F. Marek; they were married on November 26, 1955 at St. Jude Church in Detroit; children, Stephen (Jody) Marek, Janet (William) Eisner, Michael (Mary) Marek, Brian (Tracy) Marek, Karen (Donald) MacIntyre, Thomas (Trish) Marek and Ann (Marc) Boudreau; 13 grandchildren and 10 great grandchildren. She is preceded in death by her parents; sister, Delores Knecht and brother, Henry McKlin. Cremation has taken place. A Memorial Mass will be held 11 am, Saturday, November 5, 2016 at St. Patrick's Catholic Church, Traverse City. The family will greet friends starting at 10 am. Memorial Contributions may be made to St. Mary's Catholic Church, Hannah. Please visit www.lifestorytc.com to sign the guest book, share a message with the family. The family chose Life Story Funeral Home, Traverse City.